After 90 days at BACK ENSHAPE CAMP I lost 50lbs. 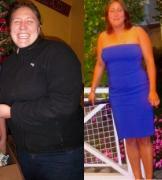 I almost gave up on my health b/c of the frustration from the lack of results within various other weight loss programs. However, ENSHAPE FITNESS gave me the overall understanding and education as to what I needed to do to create a healthy lifestyle of discipline and focus.